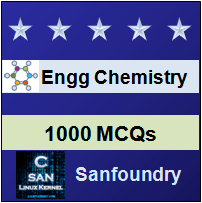 This set of Engineering Chemistry Multiple Choice Questions & Answers (MCQs) focuses on “Organic Conducting Polymers”. 1. Which of the following is used for making rechargeable batteries? Explanation: Polyaniline is used for making rechargeable batteries in the shape of flat buttons or as laminated rolled films. Explanation: The advantage of using conducting polymers in place metals is their light-weight and they do not corrode. Explanation: During the polymerisation of polyaniline, the sequence of the colour change is- Light blue >> blue green >> copper tint >> green. Explanation: The precipitate is dried under vacuum at 60-80 0C for 8hours for complete dehydration process. Explanation: The color of emeraldine salt which is obtained is green. The emeraldine salt form of polyaniline is highly electrically conducting. Explanation: The final washings of the salt is done with diethyl ether for cleaning it completely. 7. Conducting polymers having conjugation is a type of intrinsically conducting polymers. Explanation: Conducting polymers having conjugation is a type of intrinsically conducting polymers. They do not conduct extrinsically. 8. Which of the following is not true for intrinsically conducting polymers? Explanation: Intrinsically conducting polymers have poor storage stability leading to its loss in conductivity. 9. Select the incorrect statement from the following option. Explanation: Conductive element filled polymer are generally low in cost. All the other options are correct. 10. Which of the following is not an application of conducting polymers? Explanation: Rechargeable batteries, analytical sensors, electronics are some of the applications of conducting polymers. 11. Emeraldine base form of polyaniline is used as resist for lithography. Explanation: Emeraldine base form of polyaniline is used as resist for lithography. The synthesis of polyaniline nano structures is facile. Explanation: Bakelite is soild. It is a thermosetting phenol formaldehyde resin, formed from a condensation reaction of phenol with formaldehyde.